Laura Hillenbrand’s “Unbroken” is one of the best non-fiction books I have ever read. It is non-fiction that reads like fiction, with the added bonus of feeling like three stories in one - the story of a promising young Olympian, the story of a WWII bombardier who survives a plane crash, and the story of a POW who relies on his faith to carry on. I kept having to remind myself that it was non-fiction because the survival tale of Louie Zamperini and his fellow crewmates is unbelievable. Unbroken is the story of an Olympic mile-runner, young Louie, who joins the service in WWII and becomes a bombardier. After Pearl Harbor, he is stationed in Hawaii and sent on a retrieval mission to find a missing plane. While out searching, he and his crew encounter technical problems and crash into the Pacific Ocean. Louie survives and manages to get to the plane's lifeboat with some of his fellow crewmen. They drift along the sea (actually setting the record for the longest survival in a lifeboat) and cross more than 2000 miles of the Pacific. Along the way, they deal with catastrophe after catastrophe and unfortunately this was only the beginning of their journey. After finally reaching an island, they are captured by the Japanese and held as POWs, where they endure imprisonment and torture. Just like the book cover says, their story is an epic tale of survival, resilience and redemption. 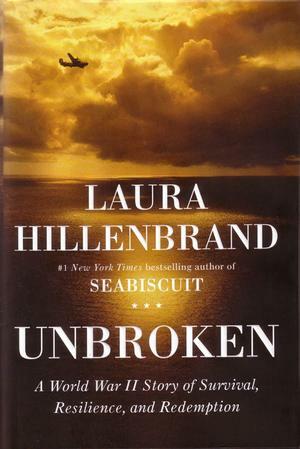 Hillenbrand, who also wrote Seabiscuit, is an excellent story-teller and she spent nearly a decade conducting interviews and doing background research for this book. When Louie and his crew-mates are stuck on that raft, you feel like you are there with them. The men deal with typhoons, starvation, dehydration, Japanese bombers flying overhead, sharks, and the endless sea stretching in every direction with no land in sight. The hardship that these men endured is astonishing. The fact that they managed to persevere, even when life didn't seem worth living, makes almost every struggle in your own life seem paltry in comparison. Louie never gives up hope that he will make it home, and this faith carries him through. The author's dedication in telling Zamperini’s story comes out in her writing, and the book ends on a hopeful note. A must-read for anyone and everyone, Louie Zamperini's story deserves to be known.